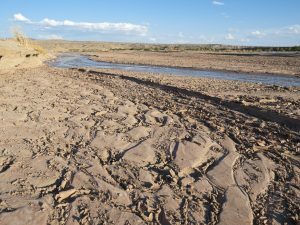 Water is New Mexico’s most precious and limited resource, but new rules proposed by the New Mexico Oil Conservation Commission (NMOCC) fall short in efforts to better protect it. In the face of increasing temperatures and shrinking water supplies, the state needs to be doing more – not less – to safeguard its future health and prosperity. That means strengthening the rules that protect land and water resources from the negative impacts of oil and gas operations. We submitted comments with our partners at NRDC and Earthworks to highlight how draft rules addressing releases of oil and gas wastewaters must be improved to preserve the resources New Mexico depends on. Here are some straightforward fixes that would go a long way in shoring up New Mexico’s efforts to protect its land and water. As written, NMOCC’s draft rules would constitute some of the weakest standards on chemicals like benzene, a known carcinogen that spreads easily through soil and groundwater, and chlorides, which are a measure of the salt content present in oil and gas wastewaters. In fact, the proposed benzene standard of 10 mg/kg is many times weaker than those in neighboring Texas and Colorado, where acceptable levels that could be left in the soil and still be protective of valuable groundwater are .026 mg/kg and .17 mg/kg respectively. Beyond containing hazardous chemicals, oil and gas wastewater can be very salty – in many cases upwards of 10 times saltier than seawater. High salinity oil and gas wastewater is the norm in New Mexico. However, the proposed rules would allow chlorides as high as 10,000 mg/kg to 20,000 mg/kg to be left in the soil – extremely high values that could severely harm vegetation. New Mexico needs to adopt more stringent cleanup standards for benzene and chlorides to protect human health and the environment. In 2008, New Mexico established soil cleanup levels for benzene of 0.2 mg/kg benzene and a maximum chloride concentration of 1,000 mg/kg – vastly more protective standards for closure of oil and gas wastewater surface impoundments. Unfortunately, these very respectable rules were repealed in 2013. We recommend a return to these technically sound and environmentally protective cleanup standards to guarantee New Mexicans the protection they deserve. Another shortcoming in NMOCC’s draft rules is the lack of any requirement that landowners be told about spills or leaks on their property and actions taken to address them. Giving notice of potential risks or damage to an individual’s property isn’t just basic transparency, it’s in line with New Mexico’s own Surface Owner Protection Act. It’s also common sense that if oil and gas operators must give notice before entering a property, they should be expected to inform the property owner of any damage or negative impacts they cause and cleanup work they perform. At least eight other oil and gas producing states require landowner notification in the case of spills. There’s no reason why this shouldn’t be standard practice in New Mexico too. NMOCC’s rulemaking is more than lax stewardship of the state’s resources and wellbeing, it’s part of a broader trend as the Martinez administration lowers the bar on its way out the door. We saw an earlier example of this when the New Mexico Environment Department issued air permits for oil and gas development that constitute some of the weakest in the nation. As oil and gas activity in the Permian continues to intensify, New Mexico will need rules that ensure the health and safety of its communities and water resources – not the legacy of hollow protections Gov. Susan Martinez is leaving behind. This entry was posted in Natural Gas, New Mexico, produced water, produced water, Water and tagged produced water. Bookmark the permalink. Both comments and trackbacks are currently closed.